Coriander, commonly known as Dhania, malli ila and cilantro in the Americas. Adding a small amount of coriander to your diet can help to keep your bones healthy and strong. Calcium is particularly present in the center leaves of coriander. 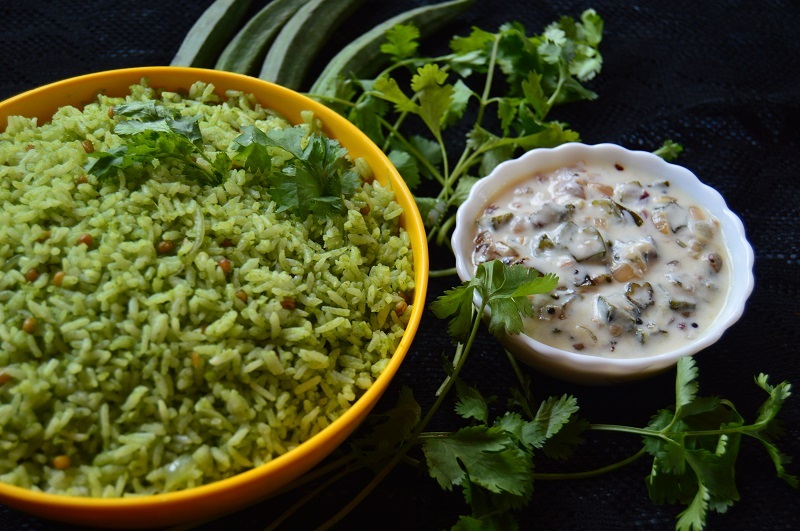 Coriander rice is the best combination with okra/ vendaikka pachadi. 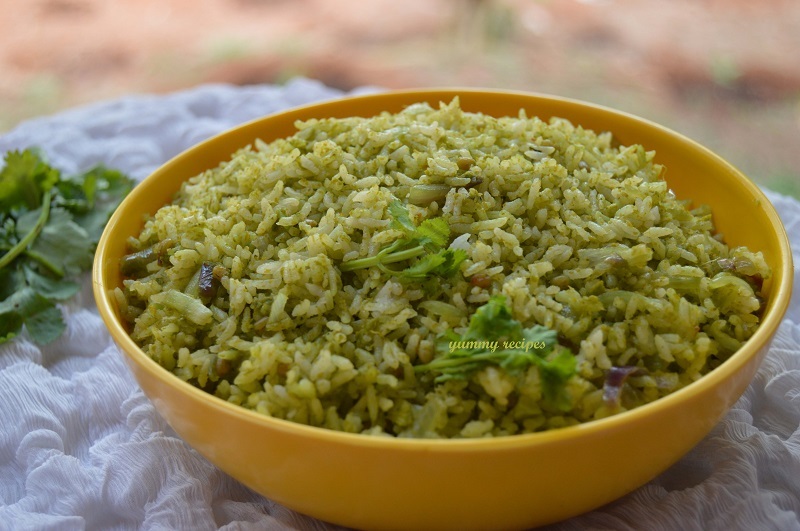 this is a simple and tasty side dish with lunch. 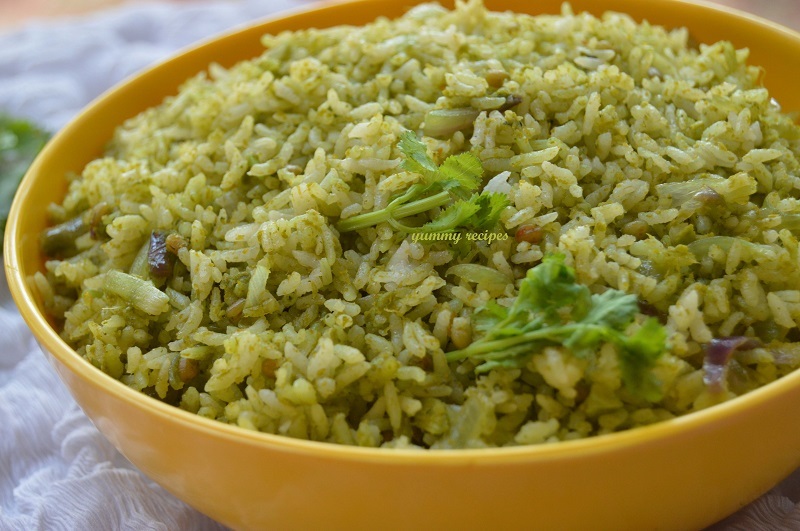 Green rice or coriander rice is a good lunch recipe. The ingredients list and the method of preparation is bellow with detailed images. Please do try and don’t forget to send your feed backs in comment box. Add 4 to 10 ingredients (coriander leaves, shallots, garlic, ginger, green chili, tomato and grated coconut in a blender and make a fine paste. keep it aside. 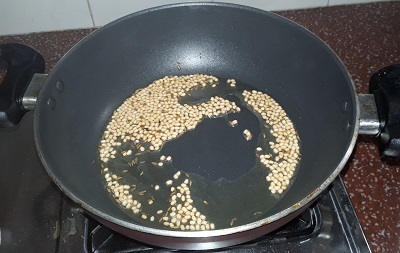 Heat oil in a pan add cumin seeds and urad daal, saute until golden brown color. Then add sliced onion and salt in to this. Fry for 2 minutes, the onion is transparent. 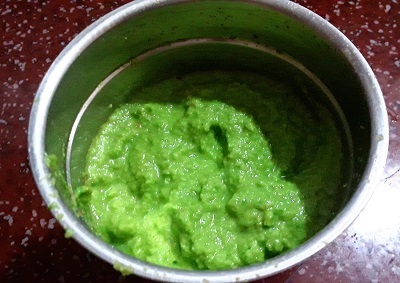 Then add coriander paste in it, mix well. till the raw smell away from it. Close the lid and cook for 2 minutes in medium flame. 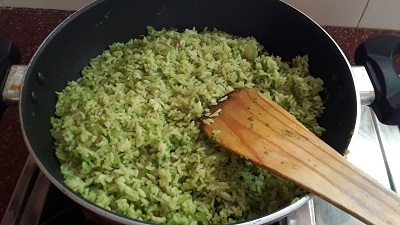 After 2 minutes open the lid and cooked rice. Combine well, the rice coated with the masala. You can check the salt. Then remove in to a serving bowl. Enjoy cooking with yummy recipes. 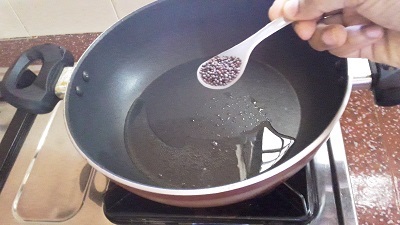 Heat oil in a kadai, add mustard seeds and allow it to splutters. 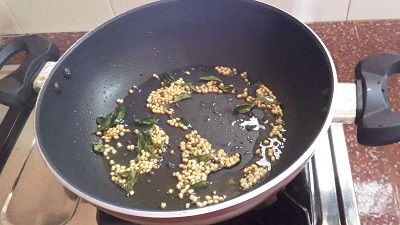 Then add curry leaves and urad daal, fry till the urad daal turns golden brown color. 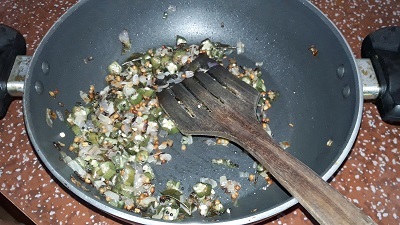 Then add finely chopped onions, okra and salt to taste. Fry till its crispy, keep it aside to cool. 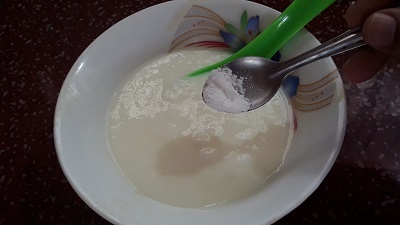 Add 1 cup curd in a bowl and salt mix it well. 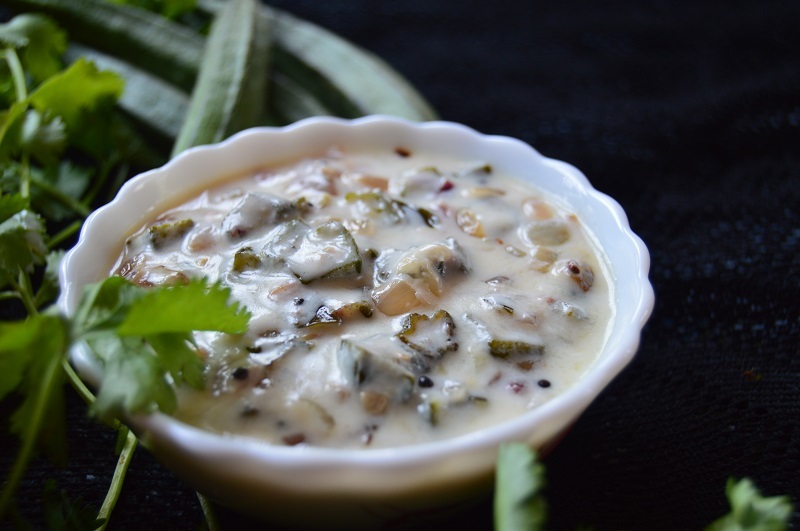 Then add cooked okra in to the curd, combine well. 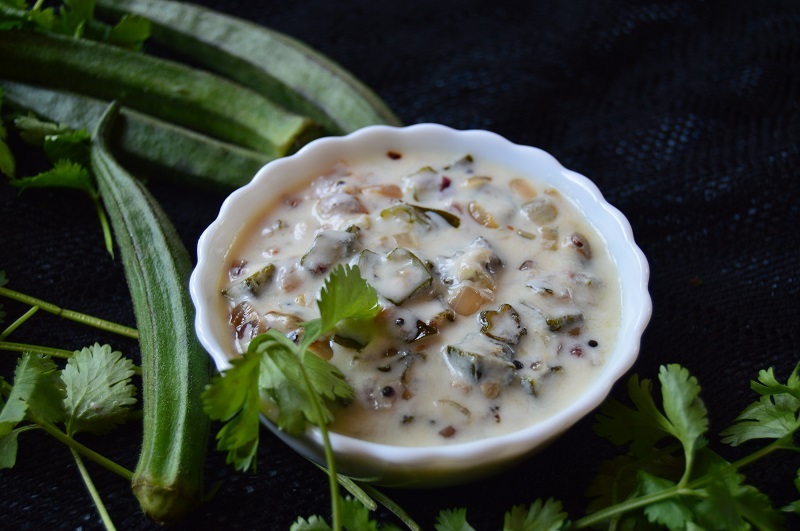 The tasty okra pachadi is ready to serve with green rice. 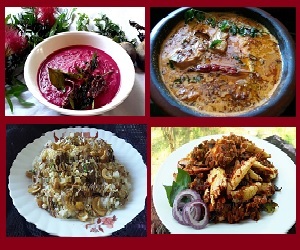 Enjoy cooking with yummy recipes.